The title page of the quarto of the play later called Henry the Sixth, Part One. Though Shakespeare took great care in the preparation of his long poems for the press, his first plays to be published did not have his name on the title page (plays were not considered real Literature). 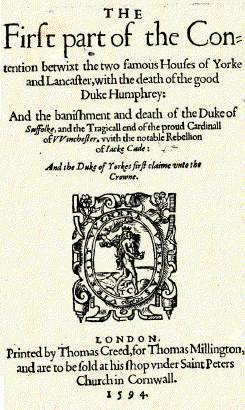 In fact, the version of Henry VI, Part Two which appeared in 1594 was one of the untidy and problematic texts that are sometimes thought to have been pirated, or reconstructed from memory. In any case its appearance suggests that it was popular. The other play that was published in this year was Titus Andronicus, the only play of Shakespeare's for which a contemporary sketch of a performance survives. Some twenty* of his plays were published in his lifetime, the later ones with his name on the title page. The name clearly became a selling point as his reputation grew; in fact, some plays clearly not by Shakespeare were published with his name on the title page in an apparent attempt to make them more attractive to the buyer. The remaining plays were published in the First Folio in 1623. The Folio is the main collection of his plays, and was published some seven years after his death by two actor friends.